Time has just flown by lately and with it, my opportunities to not only write as much as I have, but cook the way I’ve always enjoyed cooking — experimenting with new recipes. Since coming back from Mexico, I’ve been mulling over an opportunity that has taken on a life of its own and me with it. For the next year or so, I’ll be out of the house again for most of the day so will have to learn to adjust to writing here in the time I have left. I know there are many of you who do this successfully, so I’ll look to you for inspiration and perhaps a schedule! By all means, share your secrets with me so I can find a good balance. In the meantime, I wanted to share a tart I made recently inspired by yet another tart made with some lovely vegetables from Specialty Produce. Although the brief and somewhat elusive season for ramps is close to ending (April – May) , I was able to sample them for the first time. 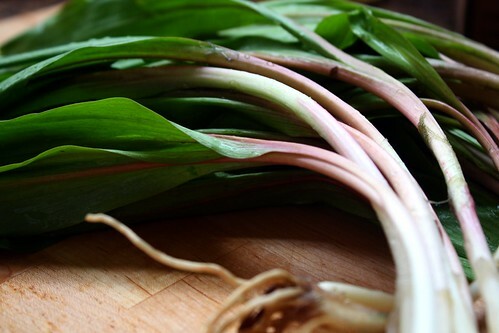 Ramps are wild leeks harvested by foraging in wooded, mountainous areas, and from what I’m learning, quite the reason to celebrate since they’re a sign of spring. Ramps are a member of the allium family, so I decided to sample them with green garlic and shallot shoots knowing that whatever I ended up making would be delicious. 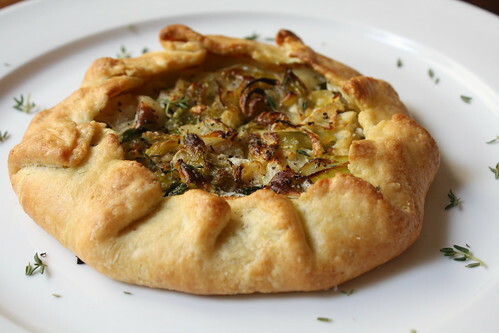 Unfortunately, the first tart was prepared for a dinner party, and since I’m challenged to find a way to shoot great photos while entertaining, I decided to recreate the tart using a different collection of vegetables from the onion family. Because I was home alone that evening, I was thrilled not to have to share this amazing tart with anyone. To make the crust, mix the buttermilk with the ice water in a small measuring cup and keep cold. In a medium bowl, whisk the flour and cornmeal, then “pinch in” the butter with your fingers until the mixture resembles a coarse meal of uneven sized crumbs. Using a tablespoon, sprinkle a bit of the buttermilk-water mixture over the meal a bit at a time and mix lightly with a fork until it begins to hold together. Only add as much liquid as needed to form a soft but not sticky dough. Gather the dough into a ball and flatten it, wrap well in plastic and refrigerate for at least 2 hours. 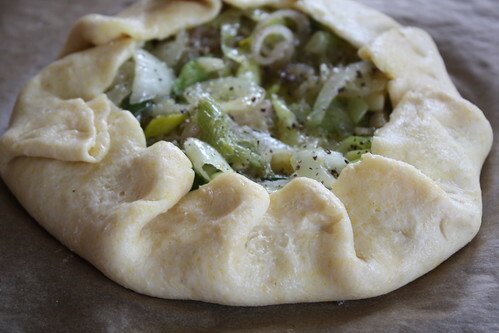 If you’d like to make two or more small tarts, divide the dough accordingly, flatten and refrigerate. To make the creme, combine creme fraiche, goat cheese, thyme and seasoning in a small bowl and stir until well blended. Leave at room temperature until ready to use. 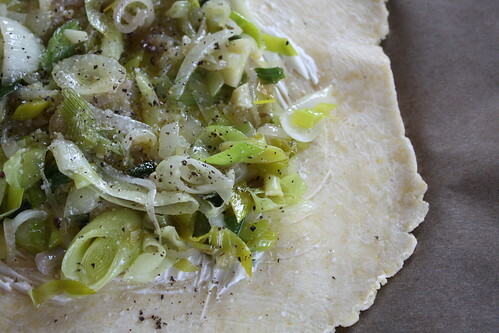 To make the filling, heat the olive oil in a large skillet over medium low heat. 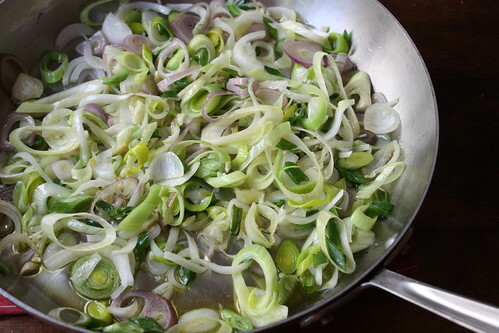 Add all the vegetables at once, stirring to coat with the oil. Cook slowly, and stirring occasionally until the vegetables are soft and very fragrant, but not browned, about 15 minutes. Season to taste with salt and pepper. Remove from heat. To make the tart, remove the dough from the fridge and between two sheets of plastic, roll into one or more disks about 1/8″ in thickness. Place on a parchment lined baking pan and spread a light layer of the creme over the surface, leaving at least a 1-inch border. 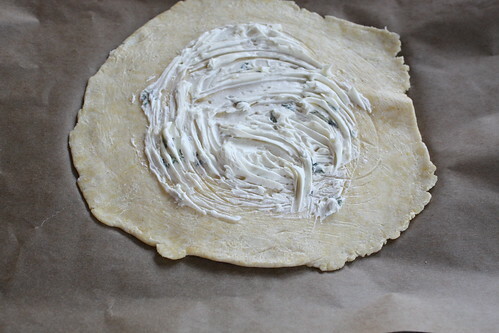 Mound the softened onion filling over the creme, and then fold the edge of the dough up over the filling pleating it as needed. Lightly salt and pepper and place in a preheated 400-degree F oven for about 15-20 minutes or until golden brown. Allow to cool briefly on the baking sheet and either serve immediately, or cool completely at room temperature on a baking rack. I made two small tarts — each about 7″ in diameter when finished. One tart is plenty as a main course, or perfect to share if you add a salad. 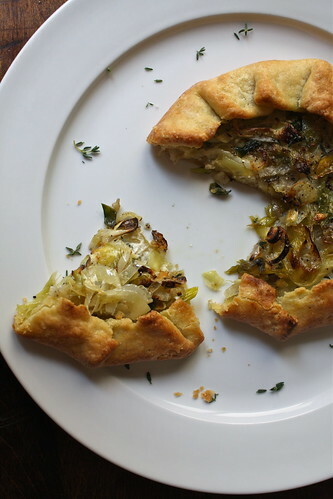 The first tart I made essentially the same way, but combined ramps, green garlic, and shallot shoots. I made three and cut them into quarters to serve as a starter with wine and most of us agreed that we’d have been satisfied to skip dinner and just eat the tarts. The crust is one of Flo Braker’s and is truly special. Although I’ve had trouble with it in the past, I bear with it because it is so delicious. It can be made with yogurt, creme fraiche, or sour cream instead of buttermilk. It can also be made in a food processor, but ends up so much more workable if you make it by hand. The refrigeration is absolutely necessary, and depending on how warm the weather is, you may find you need to pop the tart in the freezer for a few minutes before baking. The results are well worth the effort because it’s a delicate, flaky, but pleasantly crunchy crust. It freezes well, too. A few explanations about the onions: cipollines are small, flattened looking onions that fit in the palm of your hand. They’re quite sweet and have mellow flavor when cooked. 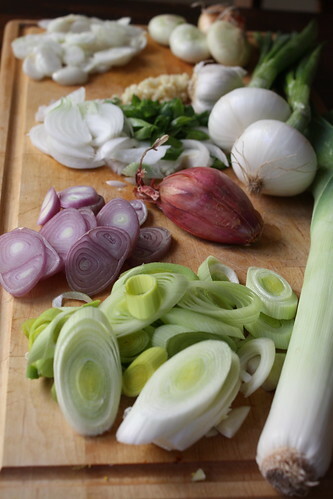 Cambray onions are also called grilling onions. They look like green onions but with larger, onion-sized bulbs. They are truly fabulous when grilled. I’ve also seen them at local farmer’s markets called spring onions, but with bulbs not quite as large. The creme is something you can truly make your own by adding other cheeses or herbs. I enjoy the tang of the flavors with the onions is wonderful. If you don’t have creme fraiche, then sour cream is good as long as it isn’t too thin or watery. This particular combination of flavors also makes for a great pasta dish. Add sauteed mushrooms to the onion mix and pour over your favorite pasta.